How come I didn't know that Netflix.com was down? It is a darn shame because I am a subscriber and I had no clue the site was not working. To be honest, I don't even know if it is working now. I haven't had the time to update my queue or watch what I have here. The messed up thing is that twice this month I have rented movies from Blockbuster, which prompted me to think about switching to Blockbuster's online rental service. Why? Because it would save me money. Blockbuster will allow me to return my online rentals in the store and pick up a movie right then and there. This cuts out my wait time and my spending the extra money. I guess it is a good thing for Netflix that I am a procrastinator and have been feeling a little on the lazy side lately. Besides, Blockbuster is slow as a thirsty camel in the hot desert when it comes to sending videos where I live. 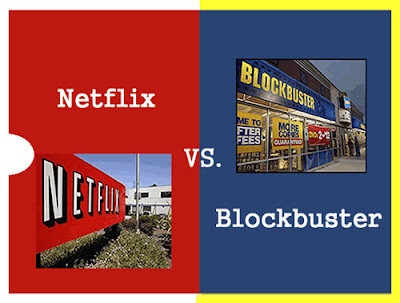 Let's face it, Blockbuster vs. Netflix is not my top priority right now. Netflix is in a tough battle with Blockbuster since they started offering the switcheroo service. For the first time, Netflix has seen a decline in subscribers. To stay competitive, they are now showing movies online for immediate viewing and reducing their prices (again). Well, the moves online thing would be great if they were old as dirt. Seriously, who really wants to watch 1989's When Harry Met Sally? Can Netflix stay competitive? I think so. Allowing online subscribers to come in and get movies, is not the heal all for Blockbuster. They loss 49 million dollars in the process of competing. At some point, they have to evaluate whether or not it is worth it and what they will do to combat the loss. If they raise their prices, that could be a plus for online rival Netflix. Netflix has to do either one of two things, start showing newer releases online or partner with a brick and mortar retailer like Movie Gallery (the second largest movie rental company behind Blockbuster) to offer the same switcheroo service that is killing it. Hey, it is easy for me to sit and judge. I am not the CEO or the CFO. I only have to decide whether or not I am going to switch.